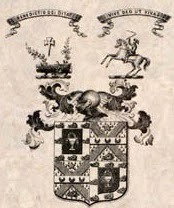 ROWLAND CRAIG-LAURIE JP (1810-96), of Red Castle, Kirkcudbright, and Myra Castle, County Down, married, in 1843, his cousin Jane, only surviving child and heir of Richard Forster Anderson, of Walshestown Castle, County Down. Mr Craig-Laurie, a magistrate for Kirkcudbright, was the elder son of John Craig (d 1837), by Jane Anderson his wife, and grandson of Rowland Craig, and his wife, Margaret Bigham, grand-niece of the Rev Walter Laurie, of Red Castle, from whom the estate descended. COLONEL JOHN CRAIG-LAURIE JP, Lieutenant-Colonel commanding North Down Rifle Militia, married though died without male issue. MYRA CASTLE, near Downpatrick, County Down, was constructed in 1844 by Rowland Craig-Laurie. None of the pseudo-medieval detail which one would expect in a castellated house of its period; relying for its effect on the skilful grouping of its elements. The castle is dominated by a tall, four-storey entrance tower, containing only stairs, with a circular turret at the other side of the front. There are simple battlements and rectangular windows, some with unobtrusive mullions. 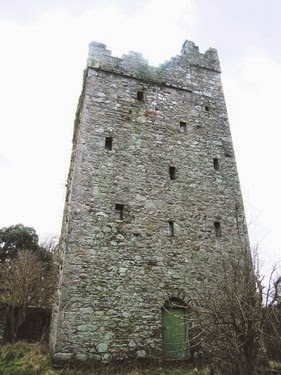 The castellated mansion house was erected to the south of Walshestown Castle (above), a 16th century tower house. Lewis states that this fort was constructed on the site of an earlier castle built by John de Courcy as part of the Anglo-Norman invasion of Ireland. 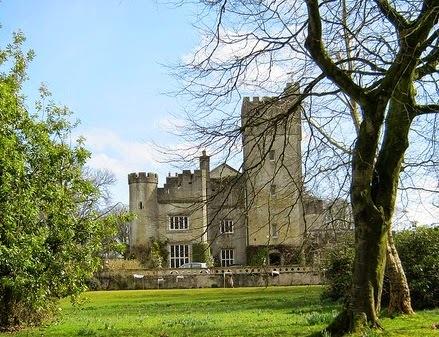 Writing in the 1830s, Lewis recorded that Walshestown Castle had been occupied by Captain Richard Anderson's ancestors since the reign of CHARLES I in the 17th century (Anderson was Craig-Laurie's father-in-law). Prior to his death in ca 1840, Anderson resided at the 300 year-old fortification, making it the only one of twenty-seven similar examples to remain inhabited during the 19th century. THE BOATHOUSE at Myra Castle, a small single-storey building located in the townland of Walshestown along the shore of Strangford Lough, was constructed between 1834 and 1859, most likely between the 1840s and 1850s when the mansion and its parklands were set out by Rowland Craig-Laurie. It did not appear on the first edition of the Ordnance Survey maps (1834) for the area, but was recorded on the second edition in 1859, where it was depicted as a small square building. The map also depicted a long pier, extending from the boathouse out into Strangford Lough; contemporary with the boathouse, the pier had also been raised prior to 1859. The main function of the boathouse and pier was to provide a landing where supply boats, laden with coal, could offload their cargo close to the Castle; however the current owner states that this initiative failed and was only ever attempted once, due to the distance between the house and the pier. The boat house is of simple rubble greywacke construction, and is largely intact. It is located adjacent to a scheduled pier, and is enhanced by a traditional County Down sea wall and high quality stone gate piers and stile, providing pedestrian and vehicular access to the shore. The group occupies a magnificent setting on the shores of Strangford Lough, and contributes to a remarkably intact cultural landscape complete with several high quality listed buildings, including the romantic 19th-century Myra Castle. THIS is the beautiful lough-shore site of the late 16th century Walshestown Castle, of which substantial remains survive in the walled-garden of the present house. Some of the planting north of Walshestown Castle had 18th century origins, though much of this has been replaced in recent decades with commercial conifers and hardwoods. The parkland around Myra Castle was created during the 1840s as a setting for the newly-built house. The designed landscape is of high quality and once contained a lake (now silted up), with cascades overlooked by a Mogul-style summer house (now roofless). The walled-garden, on the east side of Walshestown Castle, has a stream, a pond and a gardener’s house. A balustraded terrace lies outside the house. To the rear of the house, a service tunnel links the building with the stables, coach house and farm yard. A Tudor-Gothic gateway with a castellated tower adjoins the lodge. COLONEL THE RT HON ROBERT HUGH WALLACE CB CBE (1860-1929) acquired Myra Castle thereafter. Former seats ~ Red Castle, Castle Douglas, Kirkcudbright; and Myra Castle, Downpatrick, County Down. First published in September, 2016. Anon, interesting history. Leave it with me! Tim. Would you have more photos of the garden/gardener’s house or information from around 1900-1920?